Time for the next stop on our journey around the museums of central Alberta. This will likely be the shortest post because it was also one of our shortest visits. We rolled into Mirror, Alberta only to find the museum was closed over the lunch hour. Fair enough, museum employees and volunteers need to eat too. From the outside, the museum doesn’t look like much; the only hint as to what lies inside is the CN train painted on the cinder block wall. We debated about skipping it but decided to take advantage of the down time to eat lunch and check out the town. There is a caboose and boxcar in a small green space across the road from the museum. This is where we learned that in Mirror, pride is their local motive, which is a nice play on words. I thought about getting out the drone and shooting some overhead views of the caboose, but opted instead to save the battery power for our upcoming visit to Meeting Creek. Mirror has a number of older buildings of interest. 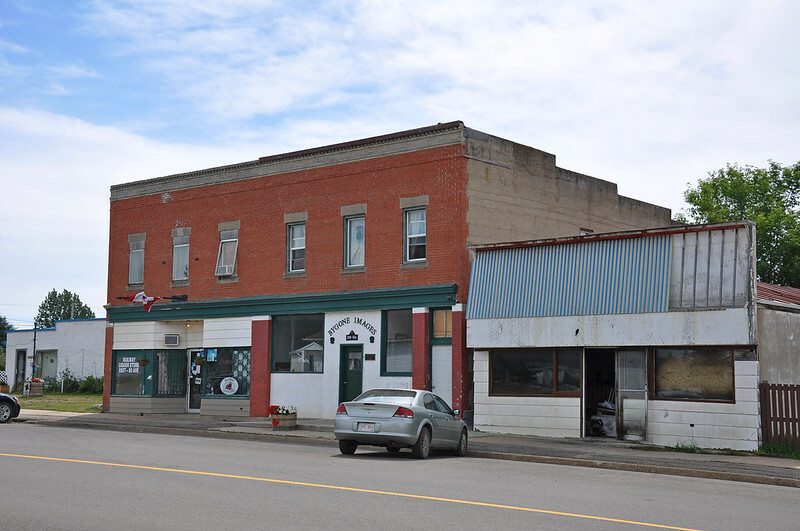 Two that caught my attention were the Mirror General Store and another commercial building just down the block. Both have been victims of some bad renovations over the years but still show some historic character. 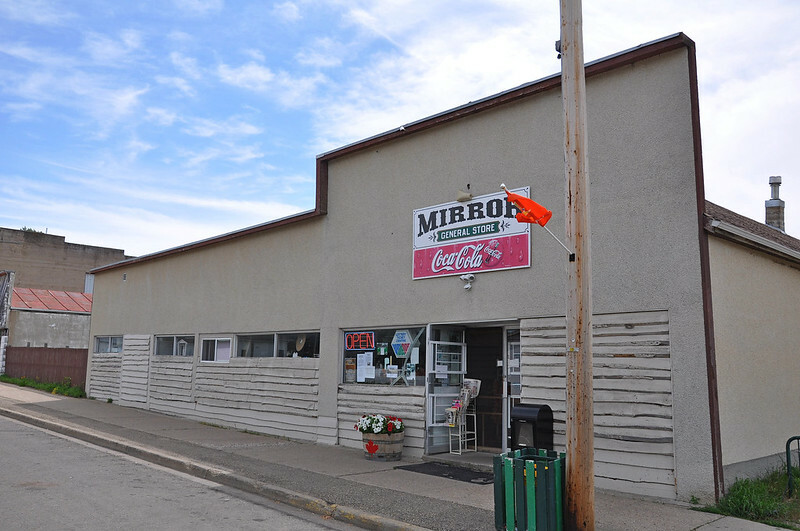 In recent years, Mirror has been victimized by a couple of fires that took down some other buildings that would have been interesting to see. In February of 2016, the 1912 Imperial Mirror Hotel was destroyed by fire, and flames claimed the century-old hardware store in April of this year. As we were checking out the town, we noticed the old school was open. Upon closer inspection, we noticed that there is a thrift store which operates out of the building. Never one to pass up a bargain, we had to stop in and check it out. I admit I was more interested in wandering from old classroom to old classroom than I was in checking out the wares, but we did buy a still-wrapped Duke Ellington CD and a spatula for a grand total of $1.25. It was nice to meet a couple of the locals and have a short chat as they wondered what a couple from Cochrane were doing out in Mirror. We did manage to get back to the museum and, once it reopened, take twenty minutes or so to browse around. Our group bought some pins and Emily and I bought a railroad spike with some eyes glued to it, which we creatively named “Spikey McSpike”. Hey, anything to support these places and help them stay open — plus he was cute. 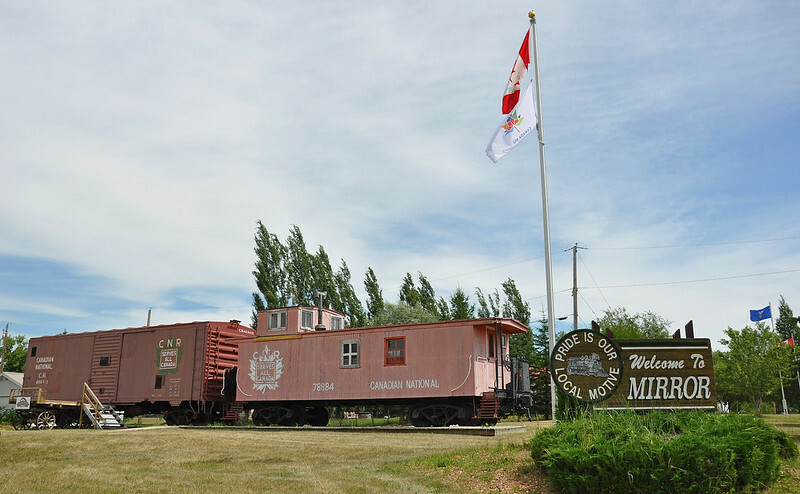 This entry was posted in Events, History and tagged Alberta, CAMT, Canada, history, Mirror, museum. Bookmark the permalink. Impatiently waiting for Meeting Creek:-) But enjoy following your journey.